That’s right kids, you read the title correctly. I’m reviewing water. In our wonderful sport/hobby, water seems to be something that gets tossed by the way side in exchange for performance enhancing beverages that have odd colors and flavors as well as electrolyte additives and etc. Well what you see here is just plain water. 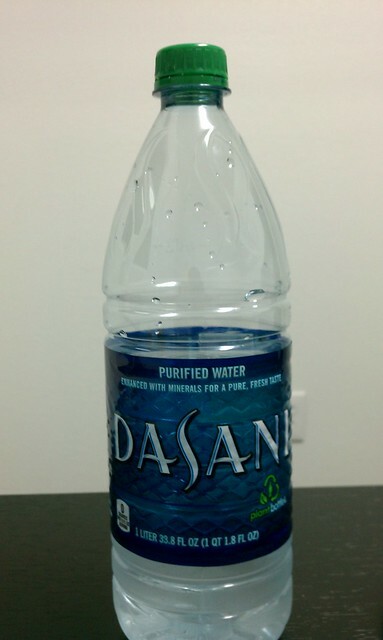 Ignore the label that it comes with, but just look at it as…WATER. It’s rare that I will bring anything else other than water during my rides. I have a hard time stomaching anything sweet while out riding. So how does water taste when I ride? Well, I think it’s pretty good. It really doesn’t taste like anything, kinda tastes like…water! It’s refreshing, keeps me hydrated, in fact it doubles as a body cooler. If my I’m over heating, all I have to do is pour some of it on my head and voila! I’m instantly cooled off! You really can’t do that with those fancy pink drinks that you spend $20 for a tub. I mean you could, but you’d be a hot mess, but seriously, why would you do that? Anyhow, I think water, no matter what brand, is superior to any other beverage out there…well beer comes 2nd to water and Bacon. Wait, bacon? Ya Bacon, have you recently had bacon? Dude, it’s so good! Speaking of bacon, have you had a good BLT sandwich? Ya you know what I’m talking about, where the bacon is thick and crispy…mmm. Well you know what goes good with bacon? A milk shake! What did you expect me to say? Water? C’mon man, a BLT needs a milk shake by it’s side. But if you’re broke and can only afford the BLT, then get a cup of water to wash it down. So there you have it. Water is great, but beer is pretty good and milk shakes go well with BLT’s! Add to the increbibleness a bacon milkshake. Two great tastes that taste great together. However, bacon-beer is no bueno. Each one is perfect on its own, but combined, their awesomenes battle each other out for supremacy. The Earth’s axis can be thrown off. Up is down, down is up, dogs and cats lying together. Previous PostPrevious (HARD) KORE Goodies! Next PostNext For A Good Time. . .